in preparing the financial statements and returns of their organisations. The Council is organising a half day seminar focusing on Financial Returns and Bookkeeping for Voluntary Organisations. 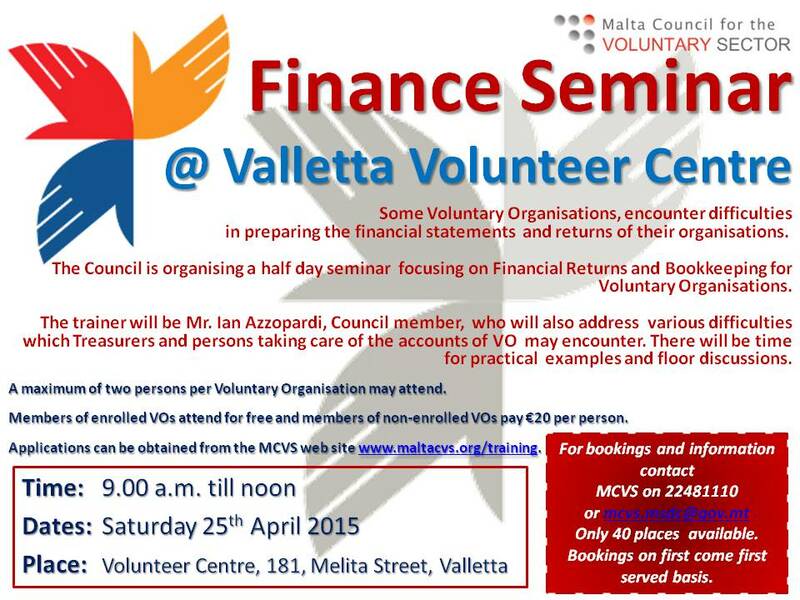 The trainer will be Mr. Ian Azzopardi, Council member, who will also address various difficulties which Treasurers and persons taking care of the accounts of VO may encounter. There will be time for practical examples and floor discussions. A maximum of two persons per Voluntary Organisation may attend. Members of enrolled VOs attend for free and members of non-enrolled VOs pay €20 per person. Applications can be obtained from the MCVS web site www.maltacvs.org/training.